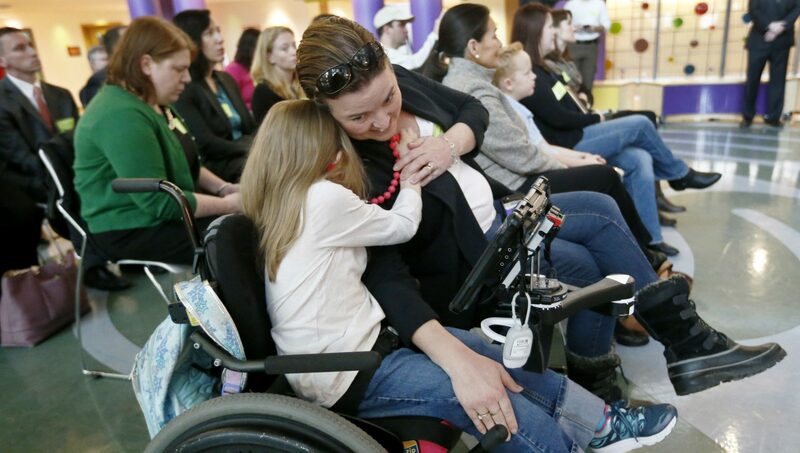 FILE PHOTO: Eight-year-old Abigail Gabriel, center, hugs her mother, Erin, from her wheelchair as Pennsylvania Department of Human Services Acting Secretary Teresa Miller, Thursday, Dec. talks about the Children's Health Insurance Program, CHIP, during a news conference, Dec. 7, 2017, in Pittsburgh. Brett Sholtis is a reporter for PA Post. He’s also WITF’s Transforming Health reporter, focusing on health policy and personal health issues. Brett previously worked as a business reporter for York Daily Record. He’s a graduate of University of Pittsburgh. (Undated) — Pennsylvania’s population of uninsured children decreased slightly amid a nationwide increase in uninsured children. For the first time in at least 8 years, the number of uninsured children rose in the U.S., according to a study from Georgetown University Center for Children and Families. In Pennsylvania, 125,000 people 19 or younger didn’t have health insurance in 2017, the report states. That’s 1,000 fewer children than in the previous year. “But 125,000 children are uninsured in Pennsylvania, and the vast majority are eligible for public health insurance, either CHIP or Medicaid,” said Colleen McCauley, health policy director at Philadelphia-based Public Citizens for Children and Youth. McCauley said federal efforts to dismantle CHIP and alienate immigrant populations are causing confusion, leaving some people thinking their children don’t qualify. She pointed to a 2017 congressional effort to cut CHIP funding, which did not pass, but which nonetheless raised enough fears that organizations such as hers sent out warning notices to families saying that they might not have CHIP the following year. Health insurance is vital for a child’s well-being and educational success, McCauley said. It also can spare families from devastating emergency room bills. From 2016 to 2017, Pennsylvania’s rate of uninsured children remained the same at 4.4 percent. The Commonwealth ranked 29th. Massachusetts had the lowest uninsured rate, 1.5 percent, while Alaska had the highest at 9.6 percent. States that expanded Medicaid in 2014, including Pennsylvania, generally showed more improvement or resilience than other states, according to a summary of the report. Three-quarters of the children who lost coverage between 2016 and 2017 live in states that have not expanded Medicaid coverage to parents and other low-income adults.